March was a good month for me. Five of the seven companies I'm invested in, were paying their dividends this month. 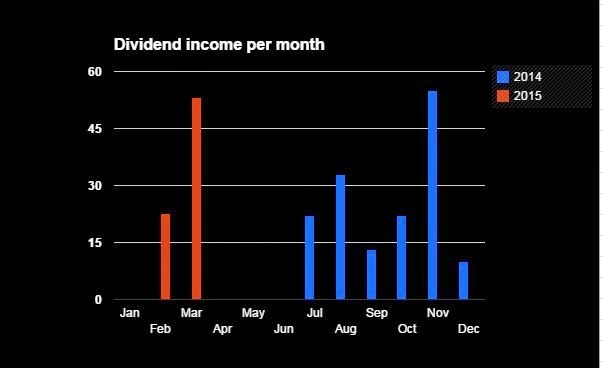 This brings the total dividends received in 2015 at $65.82. Looking at my goal to receive $300 in dividends by the end of the year, this number is not sufficient. It means I have to do more research in order to find more investment opportunities. The sooner the snowball grows, the faster it will be running down..
Keep it up! Do you DRIP your investments back to each company? I believe you can reach that goal of $300 this year! Find ways to add capital to invest. You got this! Currently my broker does not accept buying fractals, so I'm not using DRIP. Of course I do reinvest the received dividends, along with fresh capital, but not necessarily in the company I received the dividends from. Thanks for your confidence and response! Congrat....Let's press on! Before you knew it, the numbers had exceeded the target. I hope you are right. I'm doing the best I can to achieve that! True that! I'm glad I started in the first place. It's better to start rather late than not starting at all.. Thanks for your kind words, I'm going to do some research on my next investment oppertunity. Looking good buddy. You've got some really solid companies here paying you dividends. I'm a fan of JNJ, CVX and MCD and hope to invest in them once I have the right opportunity. Best of luck to you and your snowball!